that will be a festival highlight. Michael Franti thanked Mother Nature for letting him spend an extra day in Ottawa, an adventure that involved dancing in the rain, jamming until 2 a.m. at Babylon and giving a festival high of a performance on the mainstage at Bluesfest last night. "Mother Nature is a wonderful artistic director," the tall, dreadlocked singer said during a set so exuberant it drew the staunchest lawnchair dwellers out of their seats by the time it ended. The San Francisco native was referring to the mysterious force of nature that guided his visit to Ottawa, which was expected to be a regular tour stop for the BIG Summer Classic tour. Franti and his band Spearhead were scheduled to headline Bluesfest on Wednesday, but the show was cut short because of severe thunderstorms. He was able to adjust his schedule to stay another day in Ottawa, so festival organizers fit him unto the mainstage before last night's headliner, R&B songstress India.Arie. On Wednesday, Franti went with the flow and joined the hundreds of people dancing in front of the main stage, oblivious to the weather. It was his favourite part of the whole trip, he said in an interview yesterday. "Everytime the lightning burst, everyone would scream," he said, between bites of watermelon. "It was a terrible state of elation." Purple turned over the stage to Spearhead. Joined by members of the String Cheese Incident, the musicians jammed for nearly two hours, to the delight of about 200 fans who heard the rumour or went on intuition that Franti would show up at Bank Street Club. "We came all the way up here," Franti said yesterday. "I don't like to not do something.
" 'We've got four or five hours before the bars close,' we thought. 'Let's find a bar a to play in.' "
Across Festival Plaza last night, Franti's message of peace and music went out to a wider audience. Smiles beamed, arms reached for the air and people jumped up and down as Franti and his five-man band dug in to create the deliriously upbeat energy of the show. The empowering anthem Sometimes contained an arena-rock blast of Nirvana's Smells Like Teen Spirit. Stay Human brought together all the freaky people in a funky reggae party, with a guest appearance by the festival's house horn section, Texas Horns. 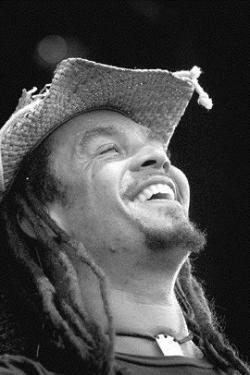 Barefoot, in jeans, a battered straw cowboy hat and worn-out Peace 2005 T-shirt, Franti spent most of his time on stage bouncing and leading the crowd in a spirited celebration. But he also took a quiet moment to talk about war, peace and lives lost around the world. With an acoustic guitar, he played his new reggae-inflected song, One Step Closer (not to be confused with the title of String Cheese Incident's new disc) then brought the house up again with positive vibe of Yes I Will.